Marshmallow is officially out now, and that means developers can update their apps with 6.0-specific features without feeling too guilty. Telegram is updating today with some Marshmallow tweaks, and at least some of you will be able to use them. Not many, though. Sorry. Here's the full changelog for v3.2.3 of Telegram. With Android 6.0 support, you'll get proper permission management. 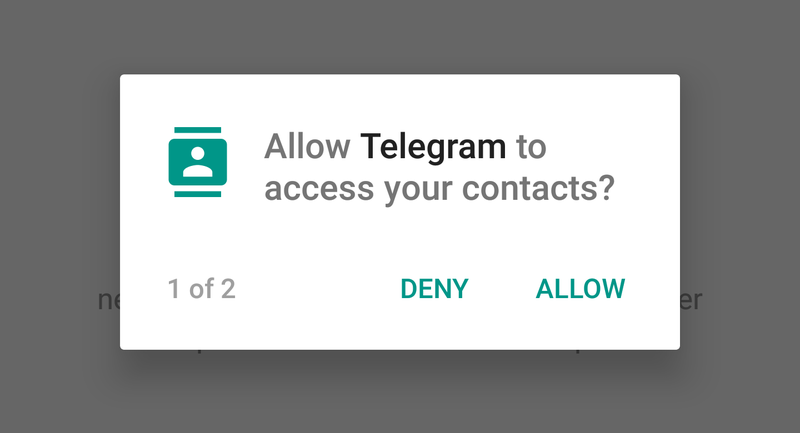 That means Telegram will ask for sensitive permissions the first time you use it, and you'll be able to toggle the permissions on and off in settings without breaking anything. I'm not sure what Telegram had to change for Now on Tap, which is also listed. That should just work everywhere on 6.0. The addition of direct share means that when you share something from another app, recent Telegram conversations can appear at the top of the sharing UI. The fingerprint support is a security option added in Marshmallow, but you'll need a device with a fingerprint reader. There are currently no Marshmallow phones with one of those, not counting the unreleased Nexus 5X and 6P. Telegram is ready, though.